Shanghai, one of the four direct-controlled municipalities of the People's Republic of China, with a population of more than 24 million as of 2014, is a global financial center, and a transport hub with the world's busiest container port. Located in the Yangtze River Delta in East China, Shanghai sits on the south edge of the mouth of the Yangtze in the middle portion of the Chinese coast. The municipality borders the provinces of Jiangsu and Zhejiang to the north, south and west, and is bounded to the east by the East China Sea. For centuries a major administrative, shipping, and trading town, Shanghai grew in importance in the 19th century due to European recognition of its favorable port location and economic potential. The city was one of five opened to foreign trade following the British victory over China in the First Opium War while the subsequent 1842 Treaty of Nanking and 1844 Treaty of Whampoa allowed the establishment of the Shanghai International Settlement and the French Concession. The city then flourished as a center of commerce between east and west, and became the undisputed financial hub of the Asia Pacific in the 1930s. In the 1990s, the economic reforms resulted in an intense re-development of the city, aiding the return of finance and foreign investment to the city. On 22 August 2013, the State Council approved the establishment of Shanghai Free-Trade Zone. Officially launched on 29 September 2013 with the backing of Chinese Premier, it is the first free-trade zone in mainland China. 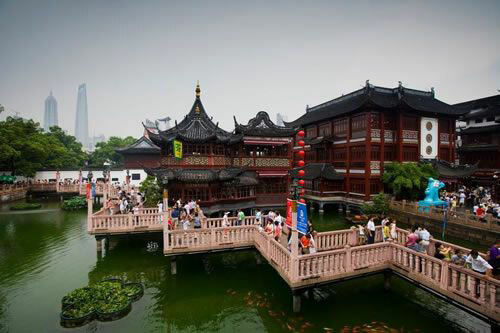 Shanghai is a popular tourist destination renowned for its historical landmarks such as The Bund, City God Temple and Yu Garden as well as the extensive Lujiazui skyline, many skyscrapers, and major museums including the Shanghai Museum and the China Art Museum. It has been described as the "showpiece" of the booming economy of mainland China. The Bund, also called Zhongshan Dong Yi Lu (East Zhongshan 1st Road), is a famous waterfront and regarded as the symbol of Shanghai for hundreds of years. It is on the west bank of Huangpu River from the Waibaidu Bridge to Nanpu Bridge and winds 1500 meters (0.93 mile) in length. 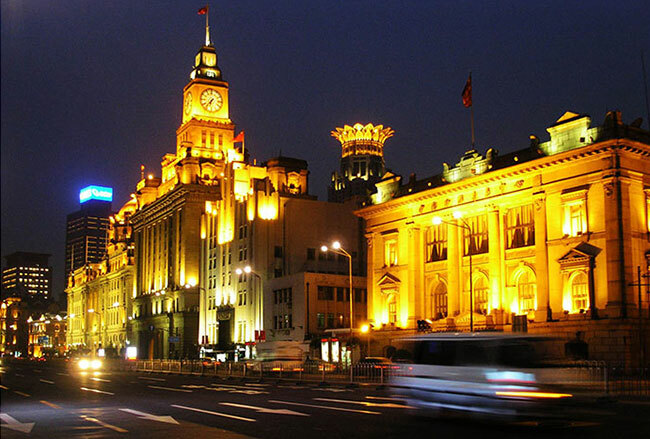 The most famous and attractive sight which is at the west side of the Bund are the 26 various buildings of different architectural styles including Gothic, Baroque, Romanesque, Classicism and the Renaissance. Nanjing Road starts at the Bund in the east and ends in the west at the junction of Jing'an Temple and Yan'an West Street. Over 600 businesses on the road offer countless famous brands, superior quality, and new fashions. KFC, McDonald's, Pizza Hut, and other world-famous food vendors line both sides of the street. 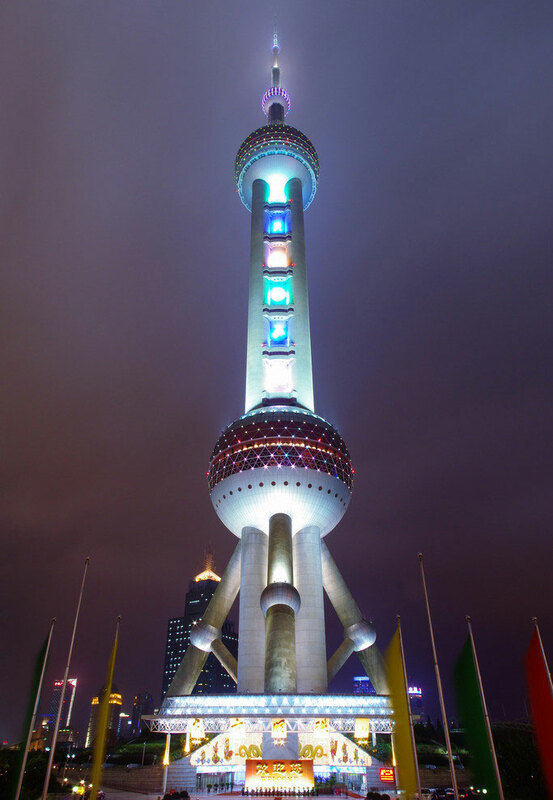 The Oriental Pearl TV Tower is located in Pudong Park in Lujiazui, Shanghai. unique architectural design that makes the Oriental Pearl TV Tower one of the most attractive places anywhere. It is amazing that this ultra-modern tower combines ancient concepts such as the spherical pearls, with 21st Century technology, commerce, recreation, educational and conference facilities. All of this and it really is a TV and radio tower that services the Shanghai area with more than nine television channels and upwards of ten FM radio channels. Standing in the center of Lujiazui Finance & Trade Zone in Pudong and neighbouring Shanghai Tower and Jinmao Tower, Shanghai World Financial Center (SWFC) was completed in August 28, 2008, being the second tallest skyscraper in Shanghai now. Having 101 floors with a height of 492 meters (about 1,614 feet), it ranked the top in the heights of roof and usable floor by the time when it was built, announced by the Council on Tall Buildings and Urban Habitat (CTBUH). Yuyuan Garden is a famous classical garden. It was finished in 1577 by a government officer of the Ming Dynasty (1368-1644). Yu in Chinese means pleasing and satisfying, and this garden was specially built for someone to enjoy a tranquil and happy time. Yuyuan Garden occupies an area of 20,000 square meters (about five acres). However, the small size is not a representative of the attractions of the garden. The pavilions, halls, rockeries, ponds and cloisters all have unique characteristics. In the western part of Shanghai there is a venerable and famous Buddhist temple, Jade Buddha Temple. In 1882, an old temple was built to keep two jade Buddha statues which had been brought from Burma by a monk. Although the history of the Jade Buddha Temple is not very long, the old-time and classical architectural style makes it unique and inimitable in this modern city. Xin Tian Di is unique because of its concept of construction. It retains the antique walls, tiles and exterior of the Shikumen housing of old Shanghai. On the other hand, its interior embodies a totally different world of international gallery, bars and cafes, boutiques or theme restaurants. When you walk into it, you will get the taste of both Shanghai in the 1920's and the sonic modern lifestyle of urbanites of the 21st century. Shanghai Disneyland Park, located in Chuansha New Town of Pudong New Area, is expected to open in early 2016. As the sixth in the world and the second in China (after Hong Kong Disneyland), Shanghai Disneyland creates many records among the existing Disney parks.